St. Patrick's Day is right around the corner, and I will FINALLY be celebrating in true Cleveland-style this year. I have been living in this city for three years now with plans to take off of work and hit the town hard every year, but something has always stood in my way. Knock on wood...but I am doing it this year! My brother and his girlfriend are coming to town (22 year-old college seniors, oh god...my poor liver...will I be cool enough to "last"? ), T-shirts are ordered, green beads are waiting, and plans have been made. Get ready, Downtown Cleveland- I've got 4 St. Patrick's Days to squeeze into 1! 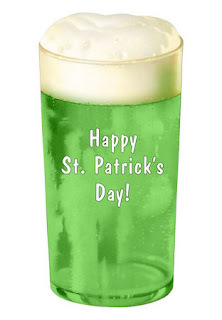 St. Patrick's Day at the Greenhouse Tavern- Running specials all day on the patio starting at 7AM. Featuring Victory Brewing Company and a Greenhouse Tavern Lager, with their famous chicken wings and street frites. T-shirts available for purchase. Flannery's Pub on East 4th Street will open its doors at 5:30AM. The celebration will include bag pipers, face painters, Irish dancers, and live entertainment from The Lucky Ones. Blind Pig St. Patrick's Day celebration includes $3 green beer pints all day, Mike "Mad Dog" Adams live at 2PM, Rover's Morning Glory radio crew, and live music from Radio Tokyo at 6:30PM. John Q's for St. Paddy's Day- Located right on the parade route, they are offering food specials all day long including: corned beef sandwiches, Irish stew, limerick soup, and a corned beef and cabbage entree. City Square Steakhouse Celebrates St. Patrick's Day with Guinness beer cheese soup, Baileys cheesecake, green beer, and Irish coffee. Nighttown Celebrates St. Patrick's Day with two show times for The New Barleycorn, Irish-inspired fare, and a special performance. St. Patrick's on Zinc's Patio- Restaurant will be grilling corned beef sliders and pulled pork sliders for just $7. Pickwick and Frolic open their doors at 5AM with drink specials, all-you-can-eat breakfast buffet from 7-10:30AM, and live entertainment. These are only a few of the fantastic Irish-inspired events and specials happening around Cleveland. What will you be doing to "celebrate"? I'm not Irish, but my liver is. it's my favorite day of the year!!! I'm not Irish either, but I do celebrate and will be somewhere in CLE. Alexa- I totally did request Friday off as well! HIG and Alexa- Hope to see you both out! Weather forecast calls for 58!!!!!! So excited!!! Hope to see everyone out and about tomorrow! Thanks for the limerick, nothingbutlimericks!